Old Venice Pizza Co. in Tupelo, Mississippi, has turned into one of our go-to places for a good and quick lunch. Dear Husband will say, “I’m thinking pizza,” and we’ll head on out to hit the pizza/hot food/salad bar buffet, washed down with draft Blue Moon — and grab a nice melty soft cookie on the way out. (Thank you to whoever puts the cookies on a tiered server up high, under the buffet’s warming lights. Genius!) Thumbs-up all the way around. 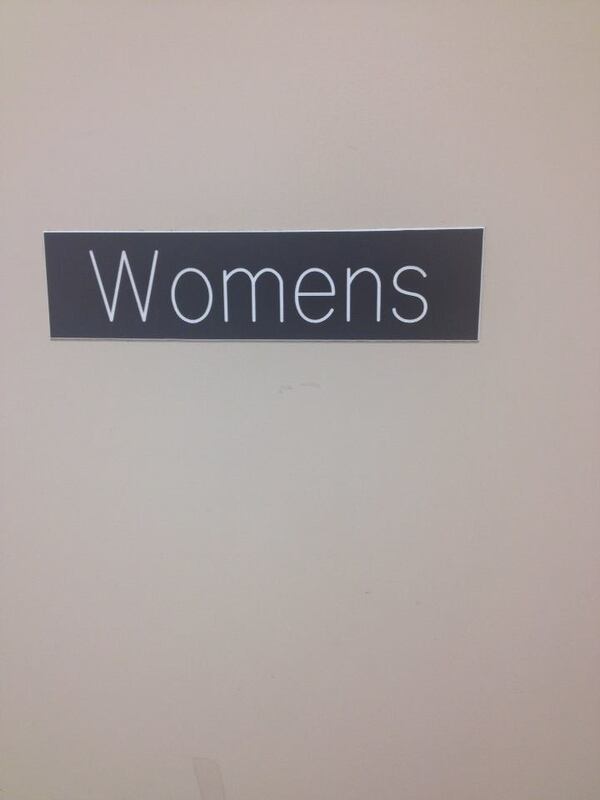 But you know a restaurant’s ladies’ room is just as important as the menu and the service — to me, anyway. And Old Venice in Tupelo passes inspection. I especially like the way the graceful branches of the dried flower arrangement echoed the intricate swirls of the wall decor. Probably whoever figured out the warm-cookie thing took care of this detail, too. And usually I manage to keep myself out of the shot but I wanted you to see my favorite purse. Younger Daughter gave it to me for Mother’s Day a couple of years ago, and I carry it practically every day from April through August. I love this purse! 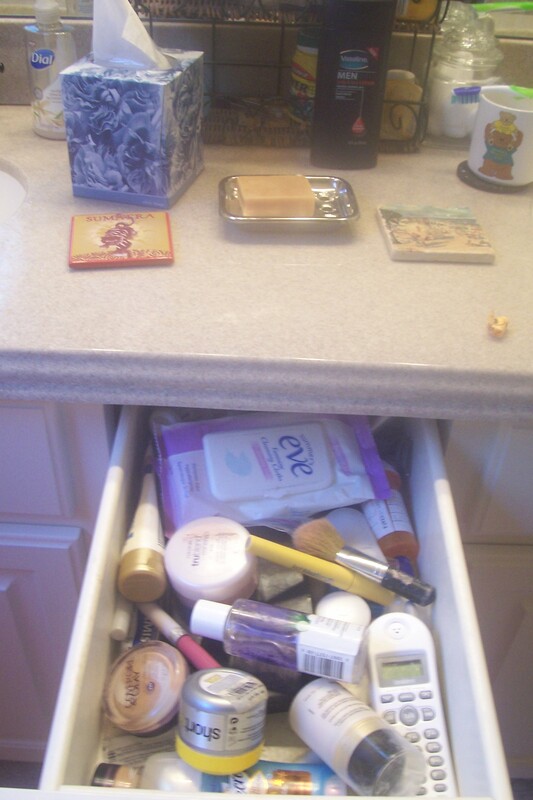 I can cram everything I need in it and it never gets full. It’s comfortable, and I get compliments on it all the time. In fact, one time in Mufreesboro, Tennessee, I left my husband to do some business while I wandered around the square, shopping and browsing trying to support the local economy. When he tried to follow me several minutes later, he correctly identified a store that seemed to be one I’d be interested in — who could resist those adorable sundresses in the window? — and went in inquiring about his wife. “Oh, she was the one with the cute green purse, right?” said the sales clerk. Right! 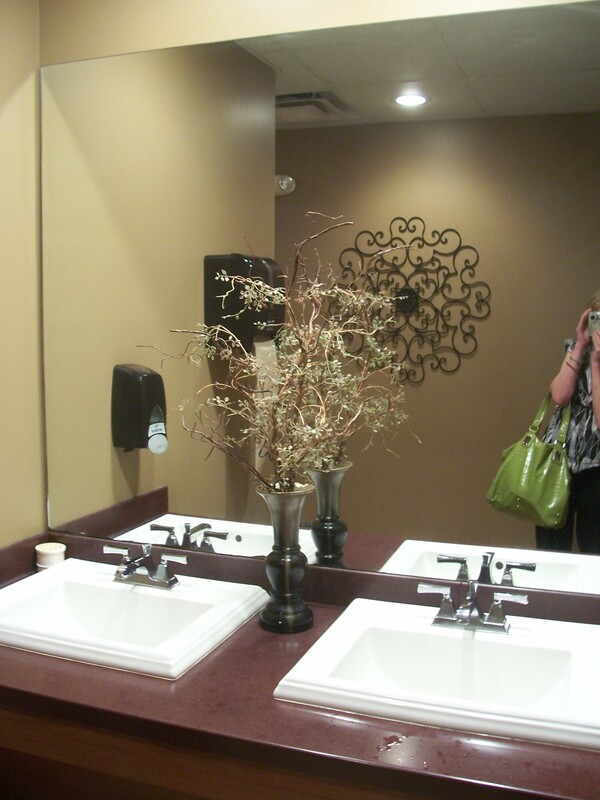 Clean pretty bathrooms and cute green purses — what else does a woman need? Oh, yes — good pizza. Go to http://www.oldvenice.com/ to learn more. My son-in-law — 2-year-old Capt. Adorable’s daddy — is an artist and a high-school art teacher, which is why one of the Captain’s first words was, “Draw!” This also is why the Captain’s bathtub is an ever-changing gallery of 2-year-old-friendly art, thanks to crayons mades especially for bathtub scribbling. And as you can see, when there’s an artist in the family, the bathtub art gets elevated beyond the average non-artist-person’s scribbling. My son-in-law is one of the most talented and creative people I know — I mean, how many kids can take a bath surrounded by Elmo and “Goodnight, Moon”? There is a downside to living with an artist, however, according to Older Daughter. “When we three do Play-doh,” she said, sighing, “I make a dog. You know, a dog. With four feet and ears and maybe a tail. Then my husband out-Play-dohs me and makes a perfect West Highland White Terrier with a name and everything.” But she’s one up on me since I can’t even make a dog. I’m very good with snakes, though. And, luckily, the Captain so far is happy with all skill levels. This is going to embarrass my friend so I won’t say her name — oh, let’s call her … let’s see … oh, let’s just randomly say her name is “Cheryl” and she maybe lives in Florence, Alabama — but I loved this inviting basket of towels in her downstairs bathroom. Doesn’t it look like a basket of Easter eggs? So pretty! And this isn’t just for company — she always has her towels like this. It’s like the most pampering and luxurious spa ever. She picks up the cheerful riot of colors in other of her bathroom accessories, and I’m particularly impressed that she uses this small piece of free-standing furniture in her bathroom to block one of the two doors into the room — offering a little more privacy and a cozy storage place all at the same time. I love how this simple thing reminds us how easy it is to add a touch of personality to a room without going overboard — or over budget — and how those small little details can make friends and family feel so special. And how you can tap in to your hidden creativity just by looking at everyday items in new ways. She inspired me to go home and, well … at least clean my bathroom. That’s a start, right? 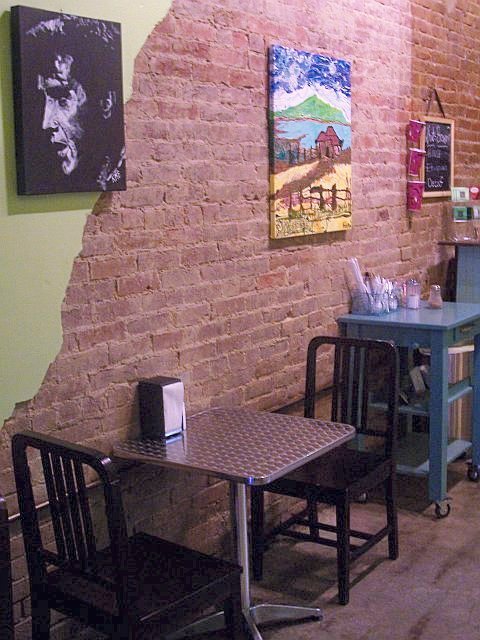 Next time you’re in downtown Tupelo, Mississippi, and you need a sandwich or coffee or just some friendly conversation, head into Cafe 212 on West Main Street. These photos show the coffee-shop part — you know it’s the most important to me! The lunch area is through the door and toward the front — it’s really the first thing you step into from the street — and it also sports a fun and quirky vibe, with delicious fresh salads and sandwiches as well. If you don’t want to sit at one of the vintage recycled tables, you can hang out on some comfy retro couches or enjoy the best sidewalk dining in Tupelo. And don’t forget to admire the works by talented local artists. Finally, you know that bathroom style always is one of my top criteria for judging a restaurant — and Cafe 212 has a great one. 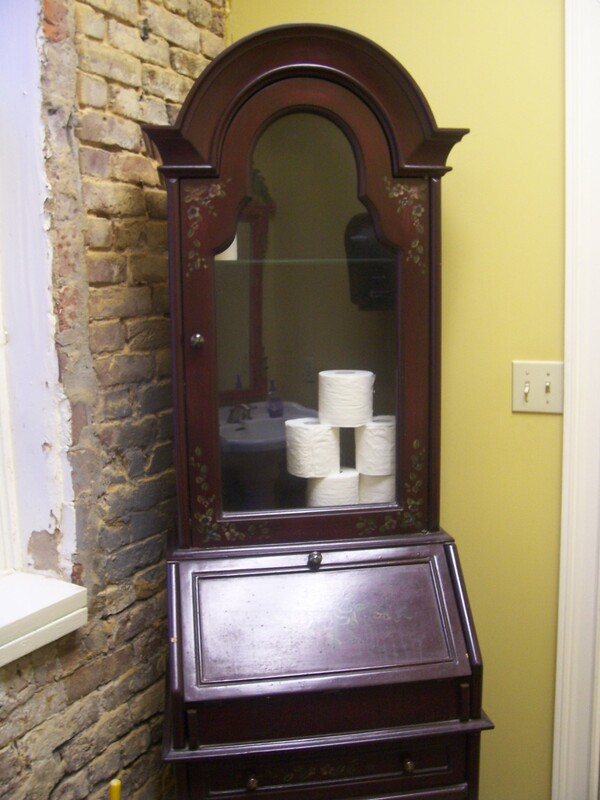 The women’s room carries out the eclectic theme with an exuberantly painted mirror and an old curio cabinet/desk doubling as storage. Visit http://www.cafe212tupelo.com/ to learn more about this Tupelo treasure.